Written by Will on May 23, 2013 and posted in Reviews and Opinions. Anodyne is an engaging top-down dungeon crawler by the two-man team of Sean Hogan and Jonathan Kittaka. While the game bears more than a passing resemblance to older Zelda titles, there is certainly enough originality on display here to judge the game on its own merits. Right from the start, the creators make excellent use of sound and graphics to set up the surreal, dream-like atmosphere which permeates the rest of the game. The 16-bit environments range from creepy suburban areas to lush grasslands to weird technicolour dungeons. However, the most impressive artistic element is the sound: unobtrusive but deeply atmospheric, the soundtrack is exceptionally good for an indie title. Gameplay mechanics and level design are pretty standard but are well executed. Particularly satisfying are the puzzles towards the end of the game that need you to use the enemies in the room to trigger switches and allow you to progress. However, the small number of item upgrades throughout the game limits the variety of puzzles you will come across. This can make the dungeons a bit repetitive and there is an over-reliance on jumping puzzles later in the game. You will also find yourself backtracking a fair bit to collect the various cards (which you need to progress) scattered throughout the overworld. Thankfully, the option to fast-travel through the Nexus prevents this from becoming too tedious. 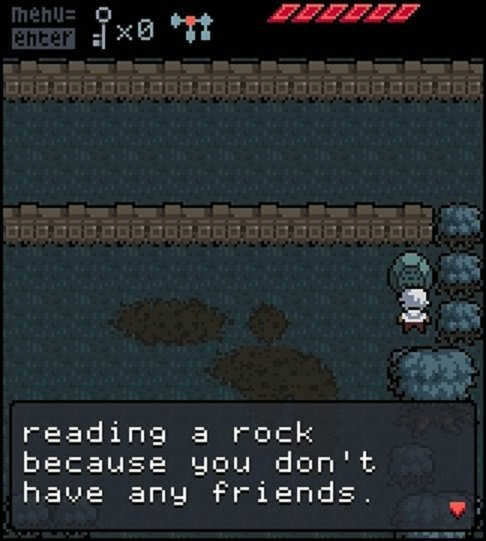 The story in Anodyne is definitely the thing that causes most difference of opinion between gamers. It is either the strongest or weakest aspect of the game, depending on who you ask. Various locations and characters seem to represent different aspects of the main character’s psyche, and your progression through these stages get interpreted as a sort of symbolic coming-of-age story. If that sounds a little high-brow or pretentious for a retro dungeon crawler, then you’re not alone. While the creepy, surreal atmosphere of the game pretty much demands some level of ambiguity to work, I prefer a story with a bit more focus.